Today after you left me in the morning and went out to do some work, I came in my room and sat on my bed with nothing particular in my mind. I was sitting peacefully there looking outside the large window enjoying the lovely weather and cool breeze of the monsoon. As I began to feel little settled, my mind on its own turned inwards and I plunged into the silent recesses of my mind and became very peaceful. I began to drink the pure cool waters from the well of deep silence. I was submerged in the prevailing serenity when…. Before my eyes, in my mind surfaced the face of Sri Raman Maharishi of Tiruvannamalai, an epitome of knowledge of Self. There was indigo blue light around Him and he was silent. His method of imparting knowledge was through silence. Mentally, I bowed down to Him and touched his Holy Feet and sat still. I am now aware that whenever I am engulfed by Divine Peace unexpectedly, great souls appear to provide me some guidelines and further communication. During this time, my eyes were comfortably closed and I did not wish to move or stir. I began to feel His presence in my aura. I was surrounded all over by the calming Light and my face began to bask in Divine Light like the falling rays of the golden morning Sun on Earth! The effusive Light penetrated my face and soothed my cheeks and eyelids. Over the sensitive skin of my face were falling the pleasantly smooth, extra-light, Light Rays and I was drenched and began enjoying their rhythmic fall one after the other! My face was bathing under the shower of delicate rays of Light! The mellow Light then enrolled in my eyes and penetrated deep inside. The feel of the Light was unbelievably soothing and amiable in nature. As they entered my eyes, my body began to receive its warmth and energy. My face was lit up with the liberal covering of the glimmering Light. What splendour! What ecstasy! I was enthralled! A calm mind is the perfect instrument to gain the knowledge of Self through Self enquiry, I quickly understood. One must ask himself, “Who am I?” It is the first step of the ladder which will help us reach the upper levels of higher spiritual knowing. “To know, is Awareness,” he told me. He explained to me that the mind is like a deep well. One must throw a bucket tied to a rope into the well and take out water from it. Go on taking out bucket after bucket of water from it till there is no water left in the well. In the same way empty out the mind of the thick layers of worldly thoughts implanted in it. A mind devoid of worldly thoughts will be merged in God. Empty your mind and remove the thoughts of ephemeral world and get established in the non changing Atman. Silence and Self inquiry is the path to Self realisation. Self inquiry leads to Awareness. Dear Mandira, with Sri Raman Maharishi’s blessing and benevolent grace, I am beginning to attempt my next post on intricate topics such as awareness, Divine consciousness and the role of the power of breath control over our life. Awareness, the art of right living. The art of living with awareness is right living. The yogic practice like Pranayam and other meditative practices are about becoming aware of the constantly flowing vital force in the breath. By doing so, the consciousness of the practitioner is raised to higher levels of awareness as the mind begins to rest in a calm state by restricting the dissipation of the life force. As one begins to gain control over his breath, he is able to bring the life forces working in him under regimented control. Through a continuous and regular practice he can control, regulate and then discipline his mind. The mind is a dynamic powerhouse and a store of infinite possibilities. The unseen power and force can be tapped and then optimally utilized for positive re-construction in multi-dimensional ways. It is observed and seen that a diffused and undisciplined mind is inept, indulgent and less remunerative. If the powers of the mind are harnessed, it yields unimaginable rewards in the form of productivity, creativity, innovation, research, philosophy, spirituality, art and craft and multifarious fields. Spiritual awakening is awareness. It is a state of awakening from ordinary consciousness to a state of higher refined understanding and knowledge. The state of realization in which one becomes aware of the presence of the Omnipresent Infinite Power within is called awareness. To operate and function from this state of being is Spirituality. Awareness is the art of living with the knowledge of what is right and what is wrong. It is about living our present life in Divine Consciousness. It is the same art that was mastered earlier by the saints, sages, seers and maharishis, who are the custodians of ancient spiritual knowledge and wisdom. The Creator in his own way, has preserved the sacred knowledge through them. The saints and the self realized souls are the guiding spirits in our spiritual endeavours and undertakings. In the ancient science of yoga, the importance of breath is stressed. Through Pranayam, the vital forces are regulated and put to use in a methodical way. Why do we need to control and discipline the breath? A restless mind is prone to regrettable actions. All our actions arise from our thoughts. The seed of the action is embedded in the thought in the mind. Thoughts make a man. If our breath is calm and clean, we possess clean thoughts as breath is connected to thoughts. Negative thoughts such as greed, jealousy, dissatisfaction, low self –esteem, loss of hope and peace, remorse etc. must be replaced by positive thoughts like gratitude, contentment, faith, self-surrender, service and devotion. To fulfill these objectives, we must always keep good company, read good books, deliberately repeat good actions as well as good thoughts and perform the act of repetition of God’s name to purify the mind. Such pious activities are a strong influence in shaping, regenerating and re-moulding the mind. How does Divine Consciousness translate into actual life? Controlled and regulated breath changes our perception. It improves the power of concentration and enhances quality of work, saves time and increases our productivity. It gives us good health vital for our well being and happiness. It gives longevity. It also increases awareness in terms of physical, mental, emotional and spiritual well being. Divine Consciousness in man is the road to sure success. Each day is an offering to God. Peace prevails in those people, who after a hard day’s work, offer their labour at God’s altar! Mandira, we must invest about 20 minutes or some more, each day in silencing our mind through God as well as guru given meditation practices in order to achieve our aims and goals. It must become a habit to bring our attention from time to time to a central point to become centered. In this way, the mind does not become flustered or agitated. It needs to be pacified and calmed for the benefit of the heart, body as well as the mind. Our senses are then not ill-bred or ill-tempered. Otherwise, in the thick of our busy schedule the mind is prone to become ruffled as well as agitated easily and we are even unaware of the state and condition of it normally. Restlessness, dissipation, confusion, anxiety, worry and fear are mind’s negative state and some corrective measures need to be adopted while we are working. So in between take a few deep and long breaths to relax and ease the flow of breathing and bring the mind once again to the mid-point to get centered. Remember that a calm and peaceful mind is our strongest weapon to combat any invasion from the unexpected directions! Oh, yes! I overlooked one important piece of advice to you my dear daughter! Every night before you sleep, always remember God by saying your prayers, thanksgiving and expressing gratitude. Keep God with you before you sleep and as you sleep through the night, His loving and gentle touch will take away all your aches and pains, worries and other disturbances caused during the day. In the morning, when your eyes open and you become conscious of the wakeful state, remember God again. Be His darling! Start your day with Him and make your day’s plan involving Him by taking his deeply sincere advice. Involve him in all the pursuits of your life. Make God your best friend! This entry was posted on Friday, June 20th, 2008 at 6:54 am and is filed under Uncategorized. You can follow any responses to this entry through the RSS 2.0 feed. You can leave a response, or trackback from your own site. When I turned to re read the blog, this post so beautifully has brought my attention to emptying of the mind.. The symbolism of taking water out of the well explains the action needed to calm the mind. Now I know how to calm my mind in times of anxiety or restlessness. Thank you for this guidance and Thanks eternally to Ramana Maharishi for teaching how to silence the mind!! I bow to the wisdom of the sages who bring this knowledge to earth !! Dear Vanita, We begin with a new chapter and a new lesson today with the blessings of Shri Ramana Maharishi. Invoke his divine Spirit in you and ask for his mercy and help so that you can penetrate inside your mind deep inside in order to purify it. I am highlighting a few lines from this post for you to capture the main points today. *His method of imparting knowledge was through silence. *A calm mind is the perfect instrument to gain the knowledge of Self through Self enquiry, I quickly understood. *Go on taking out bucket after bucket of water from it till there is no water left in the well. *In the same way empty out the mind of the thick layers of worldly thoughts implanted in it. A mind devoid of worldly thoughts will be merged in God. Empty your mind with the thoughts of ephemeral world and get established in the non changing Atman. Vanita, bringing the eternal teachings of liberation into daily practice gives us salvation, freedom and peace. Spend your Sunday on contemplating on these thoughts today. Dear Shahid, it is your current experiences that are remoulding you to a new divine person.Reaching the Super Consciousness after crossing the sub conscious level is not an easy task, it takes a lot to cross the barrier. So wait, know for sure that God is aware of what is happening and these hardships will one day turn out to be boons…. Mom, just a humble suggestion-Can we have a bigger picture of Shri Ramana Maharshi in this post ? I have read Maharishi Ramanaji’s post many many times but have always found it very difficult to understand. I do wish I can travel to The Maharishi’s Ashram sometime ! “The state of realization in which one becomes aware of the presence of the Omnipresent Infinite Power within and without is called awareness. To operate and function from this state of being is Spirituality. > Awesome, Just what my heart years for now but I know it will happen at the right divine time. My dear Shahid, Thanks very much for sending me such lovely pictures of Shri Ramana. I have changed it with one of the six that you sent on Awareness….post, will remember your kind gesture and contribution towards our blog. 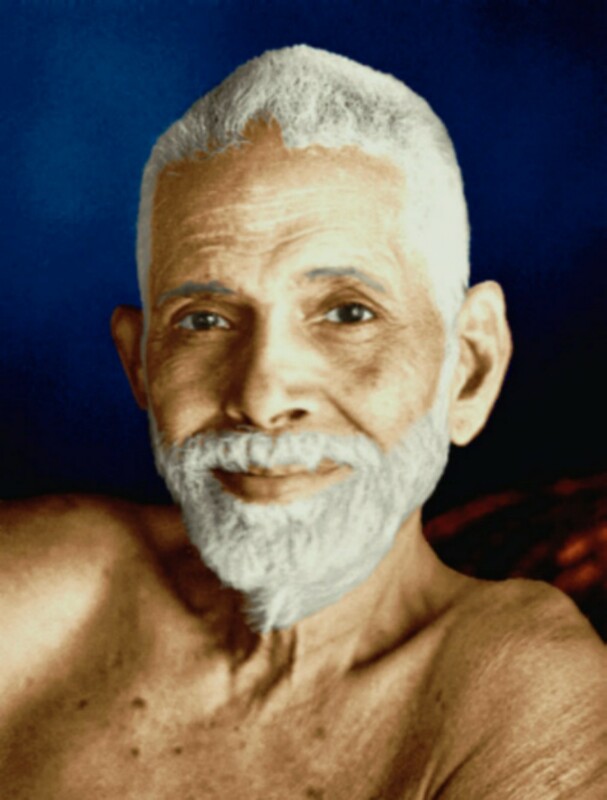 pranam to sri ramana maharshi, and ma. thank you ,ma for this post regarding awarness, and understanding us the importance of silence and breath control. – A mind devoid of worldly thoughts will be merged in God. – Spiritual awakening is awareness. The state of realization in which one becomes aware of the presence of the Omnipresent Infinite Power within and without is called awareness. Awareness is the art of living with the knowledge of what is right and what is wrong. -All our actions arise from our thoughts. If our breath is calm and clean we possess clean thoughts as breath is connected to thoughts. positive thoughts like gratitude, contentment, faith, self-surrender, service and devotion. – keep good company, read good books, deliberately repeat good actions as well as good thoughts and perform the act of repetition of God’s name to purify the mind. – Every night before you sleep, always remember God by saying your prayers, thanksgiving and expressing gratitude. Keep God with you before you sleep and as you sleep through the night, His loving and gentle touch will take away all your aches and pains, worries and other disturbances caused during the day. My dear Shilpa, ruminate on these thoughts over and over again. This paragraph is for you, especially in these days. Before you sleep recall them, when you sleep think about one or more of these vibrant thoughts. You are gaining a lot of strength with this method. Chant the mantras that are prescribed here. Yes Sarika aunty, That’s why revisiting lessons again..Chanting the mantra. Peaceful mind is needed to know “who we are”, but mind is restless like wind as pointed out by Arjuna and the senses are like wild horses. How to reach to the constant or atleast a prolonged stage of peaceful mind? Sometimes, I do feel peace and connectedness with self and the God. But such spans are very short, and my pursuit to reach the peaceful mind in itself creates a turmoil in my mind. Please guide on how to calm the restless mind? Dear Surbhi, true, the mind is restless like wind as pointed out by Arjuna and the senses are like wild horses. But Lord Krishna also advocated two things-practice and dispassion, abhyas aur vairagya, satat abhyas. The wandering and outgoing mind can be tamed and brought into control by constant practice of concentration and applying thoughts of dispassion. That means removing the habitual mind from its places of entanglements and its tendency to bend and go towards worldly inclinations. Apply this shloka in your life. Hence practice this advice and slowly the mind, when absorbed in God’s love loses its interest towards worldly inclinations. The mind has to be given far more superior matter to subsist on than what it is getting presently by the senses. When the mind receives sublime love and joy, it settles down on its own like mud in water. Alongside, also stay calm and peaceful in daily life by ignoring the trivial, the mind will settle down slowly. Your question- Sometimes, I do feel peace and connectedness with self and the God. But such spans are very short, and my pursuit to reach the peaceful mind in itself creates a turmoil in my mind. My answer has been provided by the email also. Hope you are satisfied. Thanks for answering my questions, you are indeed a enlightened soul who is effortlessly helping me in reaching the Divine. You have rightly pointed out that the abhayasa and vairagya is the key to tame the mind. With grace of Lord I am developing less craving for worldly things and now my desires are getting more and more spiritual. The truffle things do not raise so much turmoil in my mind. But, yes break in spiritual routine is biggest hurdle to this journey for devotees who’ve just started. Rightly said, practice and dispassion is the key. I hope I can continue my spiritual pursuit during yet another holidays in India. Surbhi, there will be many breaks many times but do your practices whenever you have time and commit yourself to a life long relationship with God. One way for making up is by doing mental chanting during the day and by doing chintan, contemplation. These two things are possible when we do our daily life activities except that energy spent in unnecessary talking and discussions have to be avoided. Close your eyes in between while you are in a car or on a flight and remember God. Similarly find those short spells of free space when you can connect to God inside. In this way your sadhana will continue. – perform the act of repetition of God’s name to purify the mind. – Peace prevails in those people, who after a hard day’s work, offer their labour at God’s altar! Dearest Ma…I love to go through all the comments of the blog and pay special attention to your replies. Your advice to Surbhi really caught my attention and I made a note of it to try to inculcate it in my life. *The wandering and outgoing mind can be tamed and brought into control by constant practice of concentration and applying thoughts of dispassion. That means removing the habitual mind from its places of entanglements and its tendency to bend and go towards worldly inclinations. *Hence practice this advice and slowly the mind, when absorbed in God’s love loses its interest towards worldly inclinations. Alongside, also stay calm and peaceful in daily life by ignoring the trivial, the mind will settle down slowly. *There will be many breaks many times but do your practices whenever you have time and commit yourself to a life long relationship with God. *One way for making up is by doing mental chanting during the day and by doing chintan, contemplation. These two things are possible when we do our daily life activities except that energy spent in unnecessary talking and discussions have to be avoided. *Close your eyes in between while you are in a car or on a flight and remember God. Similarly find those short spells of free space when you can connect to God inside. In this way your sadhana will continue. – Calm your mind. Calm mind is our weapon to battle with our enemies ( shad ripus). Seeds of good karmas reside in peaceful mind. – Awareness is the art of living with the knowledge of what is right and what is wrong. It is about living our present life in Divine Consciousness. – Start your day in remembrance of God, and before sleeping always do prayers and thanksgiving to the God. – Everyday spend atleast 20 min in meditation – to silence your mind. Ma, I am trying to concentrate my mind and focus it on God. This post is very helpful for me to follow the path ahead. Few questions Ma: 1. What is the difference between awareness and sadsat vivek buddhi.? 2. How should we deal with people and situations which disturbs our mind and makes us restless, in fact how to practice living our life with God’s will. My dear Supriya, these posts are very helpful for beginners when they have to be mindful, be alert and be conscious of every move of theirs. Be they in mind or body. When we become aware of our self and we do self inquiry, we are developing awareness about ourself and our actions and thoughts. This is awareness. Later on, we also watch our breath because mind and breath are interlinked. They are supplying energy to one another. If either is controlled, the other is also controlled. Controlling breath pace and pacifying it is a part of Yoga. Sadsat vivek buddhi is a new term for me. I checked on net for this word in Marathi. It shows the meaning as consciousness. If it is correct, then it means the chetna shakti of our soul. Otherwise, in literal sense vivek and buddhi means wisdom and intellect respectively. If you could please tell me a little more about this word and give me a reference,I will be in a position to explain better. Thanks for your reply and valuable guidance. As you explained, awareness is “developing awareness of our self and doing self inquiry”. Now I can relate – In Marathi awareness is “जाणीव “. As per my understanding, “सद्सद्विवेक बुद्धी ” is again knowing our self and knowing what is right and what is wrong and think and act accordingly. If we are aware of our actions and its implications then we can take right decisions at right time. सद्सद्विवेक बुद्धी guides us to move on the right path considering its outcome (sadkarm) when we are in a mess or we have many options to choose from. I have read that Yogis always use their सद्सद्विवेक बुद्धी to behave consciously. They are always alert and mindful and do the Sadkarma only. Now after your explanation I could relate that if we develop our awareness (mind and body) then it boosts or developed our “सद्सद्विवेक बुद्धी ” and prohibits us from doing bad karmas. Please correct me wherever I am wrong or misunderstood the concepts. It is the first step of the ladder which will help us reach the upper levels of higher spiritual knowing. The mind is like a deep well. One must throw a bucket tied to a rope into the well and take out water from it. Go on taking out bucket after bucket of water from it till there is no water left in the well. In the same way empty out the mind of the thick layers of worldly thoughts implanted in it. A mind devoid of worldly thoughts will be merged in God. Empty your mind and remove the thoughts of ephemeral world and get established in the non-changing Atman. Silence and Self enquiry is the path to Self realisation. Self enquiry leads to Awareness. Through a continous and regular practice, he can control, regulate and then discipline his mind. A restless mind is prone to regrettable actions. All our actions arise from our thoughts. The seed of the action is embedded in the thought in the mind. Positive thoughts like gratitude, contentment, faith, self-surrender, service and devotion. Deep gratitude for this rare and precious teachings Maharshi Ramana and Maa.